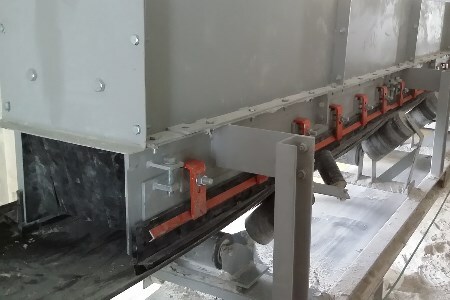 UK-based provider of quicklime and chalk products, Singleton Birch, has implemented a dust and fugitive material control strategy from Martin Engineering, after discovering that an estimated 10 – 20% of material was spilling along its belt path. The upgrade included a rebuilt transfer point where material dropped 20 ft from one belt to another. Singleton Birth currently produces 1.5 million tpy of processed limestone and chalk, as well as around 0.3 million tpy of calcium oxide products. Despite the existing enclosure confining the fugitive dust, serious issues still arose due to the sheer volume and density of the particles. Significant safety issues included the ingress of abrasive particles into the bearings of rolling components, causing them to seize, leading to increased friction on the belt – a potential fire hazard. In addition, dust would build around the loading zone and encapsulate the tail pulley. This eventually let the belt to slide over the built-up material, rather than riding on the rollers, fouling the return side of the belt and the face of the tail pulley. Fugitive material would also travel freely throughout the long tunnel that housed the conveyor belt, piling up and restricting access to maintenance workers. To address these issues, Martin Engineering’s local office in Nottingham UK proposed a strategy that aimed to contain the dust at point of production by creating an environment that would quickly settle particles and return them to the cargo flow. The strategy included raising and lengthening the existing chute to create a more robust settling zone. A Martin ApronSeal Double Skirting HD and EVO External Wear Liner were also integrated into the extended chute to protect the chute wall and seal in the dust. As a result of the upgrade, spillage and accumulation along the walkways and around the mainframe have been eliminated. There has also been no encapsulation of the belt or tail pulley since the installation, while rolling components are far less prone to fouling.